Following today's news that Warner Bros. has given a June 17, 2016 release date to The Nice Guys, DreamWorks Animation has moved How to Train Your Dragon 3 from that date to June 9, 2017, while confirming voice cast members Jay Baruchel, America Ferrera and Cate Blanchett. The animated comedy sequel currently has its new release date all to itself, for the moment. Take a look at DreamWorks Animation's official announcement below, which includes the news that this year's How to Train Your Dragon 2 has crossed the $600 million milestone at the global box office. DreamWorks Animation's How to Train Your Dragon 2 continues to breathe fire into the global box office as it officially crossed the $600,000,000 mark on Labor Day. A record-breaking opening in China coupled with phenomenal success in territories around the world have catapulted Dragon 2 to become the highest grossing animated film of the year and one of the top ten grossing films of the year in any genre. 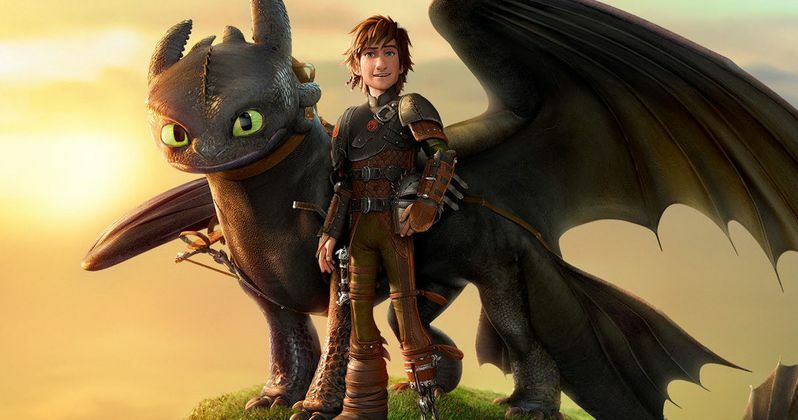 On the heels of the success of their latest epic adventure, Hiccup and Toothless have plans to soar across the big screen once again with the announcement of the third chapter in DreamWorks Animation's How to Train Your Dragon series shifting to a June 9, 2017 release date. From the same creative team as the first two films, writer/director Dean DeBlois and producer Bonnie Arnold, How to Train Your Dragon 3 continues the story where the sequel leaves off (sorry folks, no spoilers here). Returning cast includes Jay Baruchel as Hiccup, America Ferrera as Astrid and Cate Blanchett as Valka. Through Monday, How to Train Your Dragon 2 has grossed $174 million domestically and $426 million in international markets. Do you wish How to Train Your Dragon 3 would have kept its 2016 release date instead of moving to 2017? Chime in with your thoughts below.